As is said in Japanese saying, “Neither heat nor cold lasts beyond the equinox.”, September of Japan is still summer with gradual cooling. This year, however, our usual hottest and sunniest summer ended as a wet season with lower temperature and since late August I’ve sometimes felt autumn-like air. 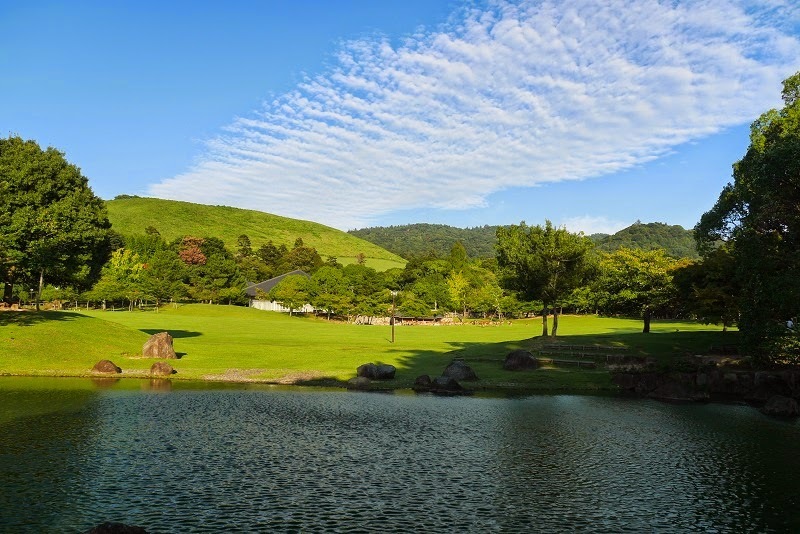 When I walked in Nara Park from late afternoon to night on 8th of September, cool and crisp air was comfortable under the high blue sky with autumn clouds. 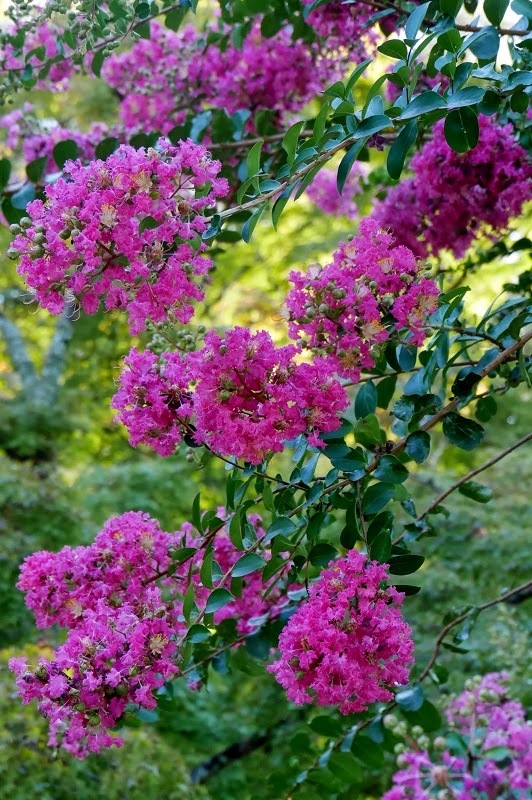 Japanese crape myrtle bloom over a long period from mid-summer to early-autumn. Since this year’s summer heat was not so intense, the flowers were still fresh and brilliant. Leaves and grasses were still summer green. At Ara-ike Park, the colors of some foliage were turning yellowish and some were tinted with gold in the evening sun. 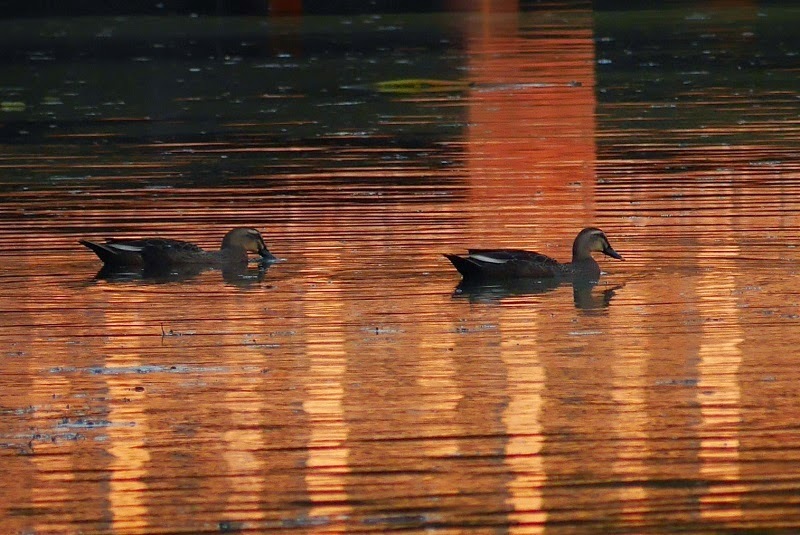 At Sagi-ike Pond, ducks were swimming in the vermilion-gold water, the reflection of the Ukimi-do Pavilion aglow in the evening sun. 8th of September was the harvest moon night (Chushu-no-meigetsu in Japanese), the fifteenth night of the eighth month of the lunar calendar. Still more, the moon of the next day 9th was Super Moon, 14 percent larger and 30 percent brighter, as it came closer than usual to the Earth. 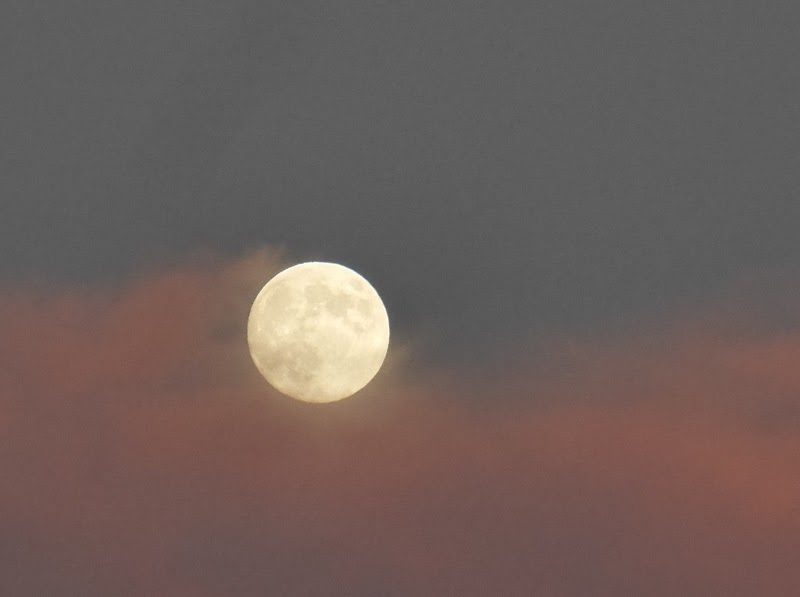 The moon is appearing from the clouds. The extraordinary big and bright moon rose high above and shone over the world. 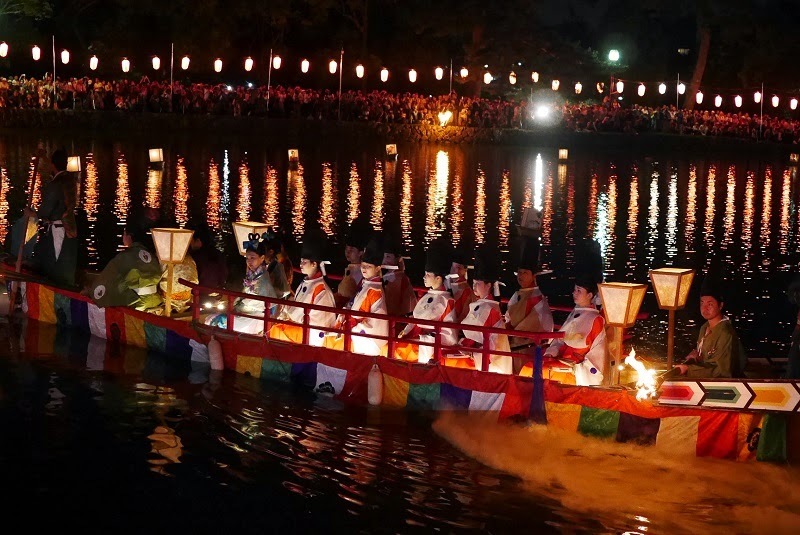 On the way to the train station, two dragon-headed boats were going around Sarusawa-ike Pond as a part of Uneme-matsuri Full-moon Festival . Thank you, Mersad, for hosting. What a beautiful place and spectacular views ! I am delighted with the landscape in the first picture and a view of the park ! fabulous images. love the deer image. beautiful scenery. it's just beautiful. 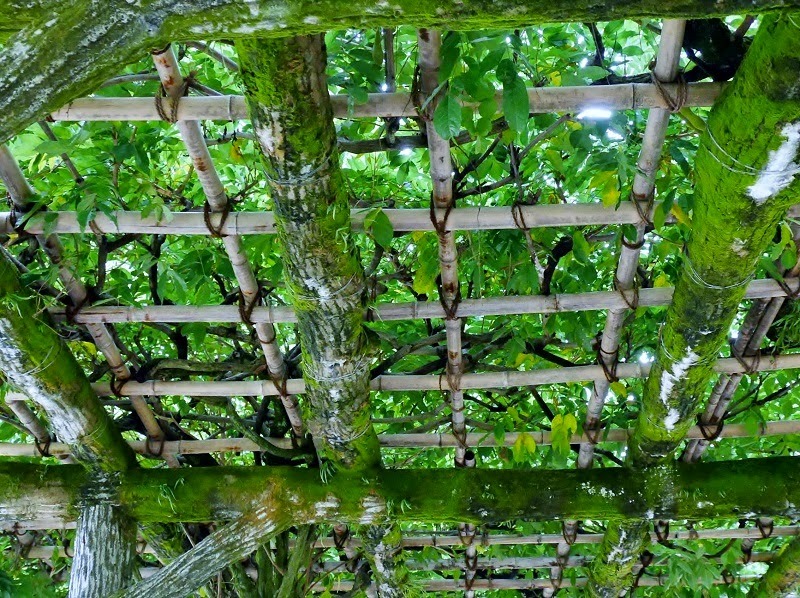 i like the wooden trellis and the old earthen wall! 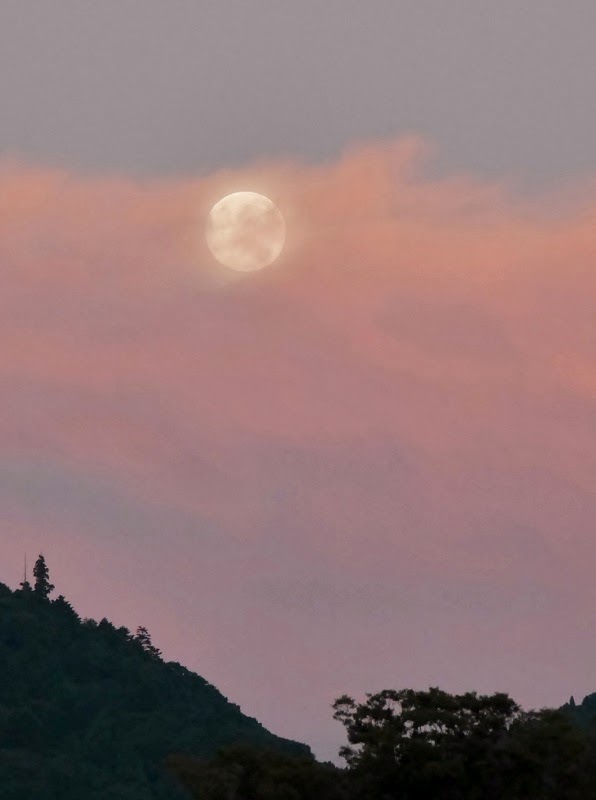 Yoko, I'd really like to have seen your pink sky and super moon in person. I did see it casting it's reflection on the sea but didn't take photos. Our skies were inky blue with some cloud. The construction of the mud wall is very interesting......and beautiful. Lovely photos,especially the last three! Det är en fin miljö ni har att vandra i . Så trevligt med båtarna. 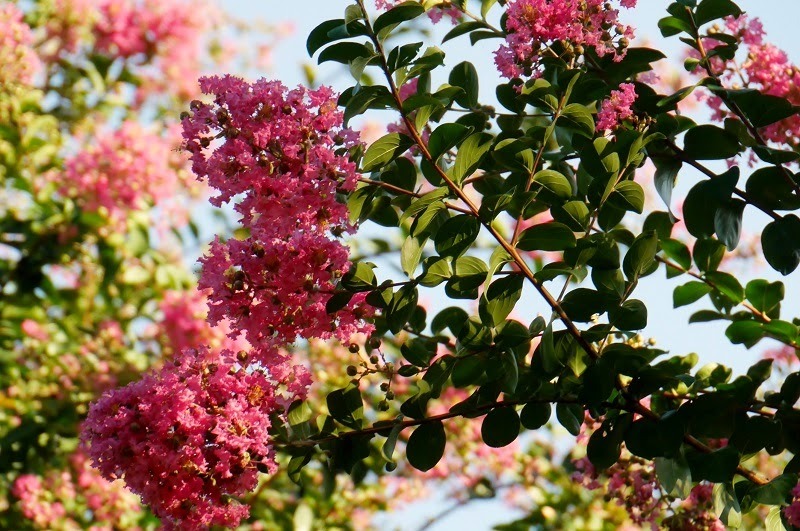 Hi Yoko, Your September photos are beautiful. I'm so glad you are still blogging as I have been away for so long and have missed your magical images. The moon has been wonderful here in the UK as well and I especially love your deer photos in the park, so peaceful. 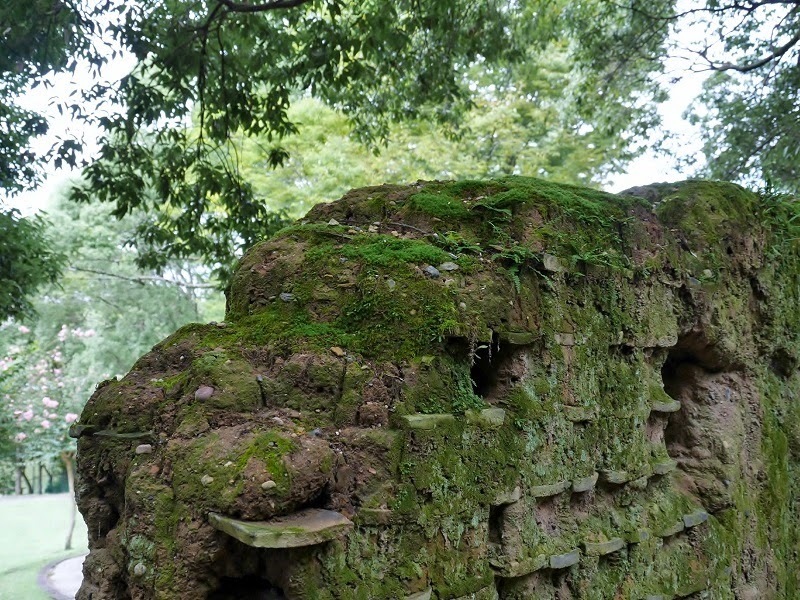 I was just wondering if you have heard of the Mori, forest fashion in Japan? I love it and have a Pinterest board called Mori fashion. I thought of you as we share the same love for woodland nature. 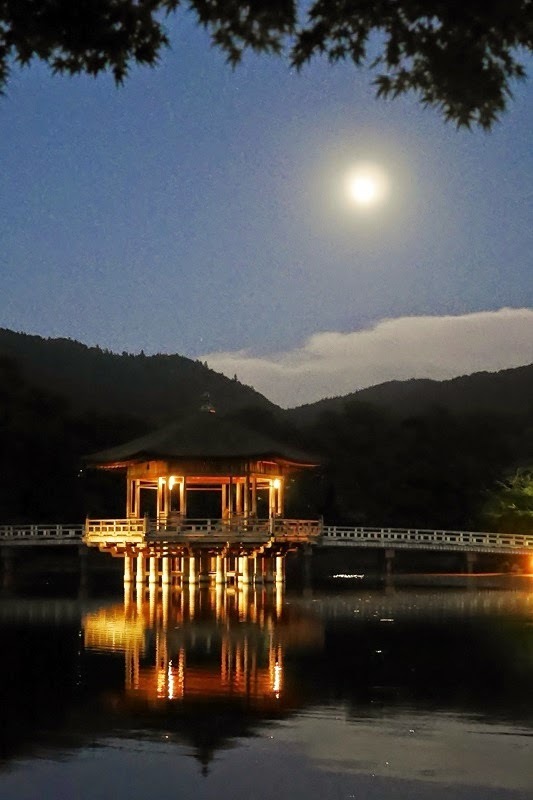 The bright moon shines like a lamp and casts a magical glow upon the people in the dragon-headed boats. It is amazing to realize that the ancient mossy wall had been made by builders under the same moon but experiencing a different lifestyle! "Deep Blue" ｢深い蒼｣ in the sky is amazing. I think it's important in a photograph. 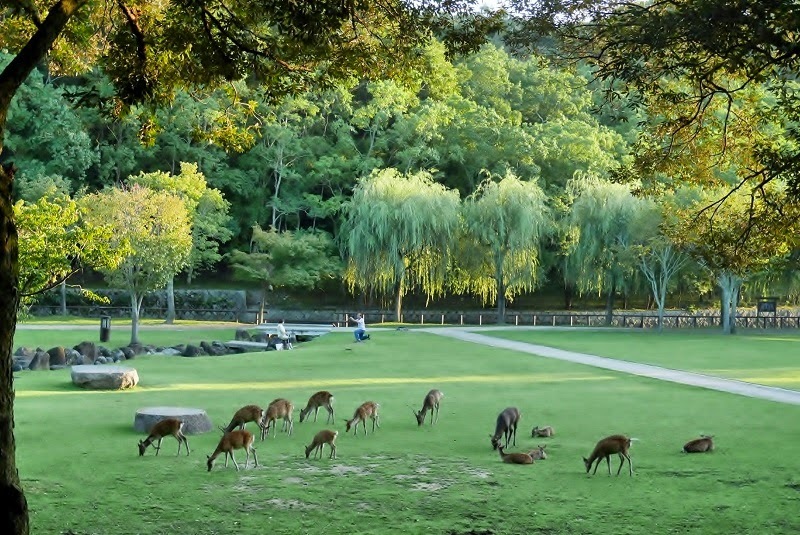 Elegant relaxed atmosphere of Nara Park. Night view is fantastic impression. I feel the traditional profound. What a beautiful park. I like the first photo. The sky and the green are really nice. As fotos noturnas são simplesmente fabulosas! Thank you !!!! For sharing this beautiful place with us ! Your pictures are gorgeous !!!!! Here in Germany the foliage of the trees already tend to change their colour from green to yellow - that's definitely the sign for a beginning autumn season. 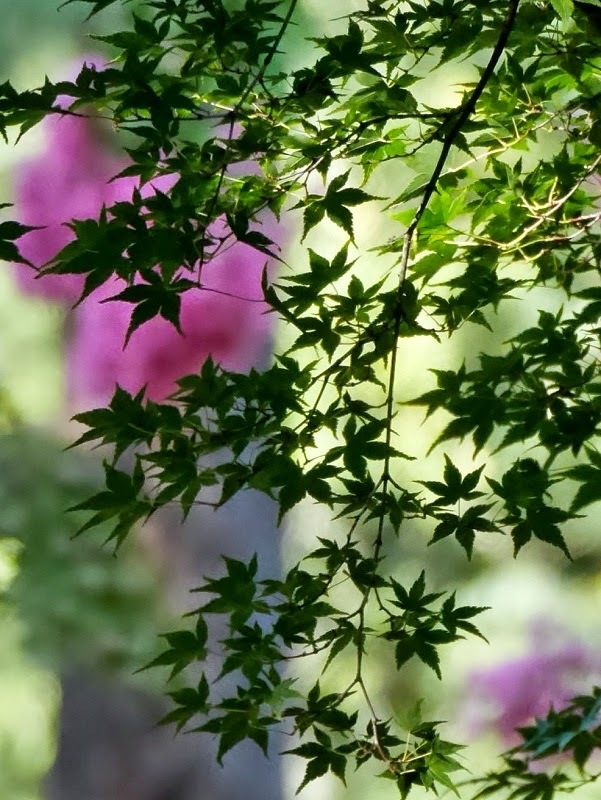 I'm looking forward to seeing the leaves of the Japanese maple turning from green to red! All the best from Germany, Uwe. Just stunning. I love the night shots. It must be nice to have cooler temperatures. Wow -- another beautiful set of shots. How tranquil, Yoko - and the changing light bathes everything in a special glow. Our trees are changing rapidly here at altitude from green to gold. We're busy packing the Denver house - it's sold and by October, we'll be in Breckenridge permanently. What spectacular photos Yoko, I have fallen in love with the ducks swimming in the gold reflection from the Ukimi-do Pavilion, and the dragon headed boat with all of the passengers faces lit up. All seasons are beautiful in your country abd in your pictures. What a peaceful looking park.